Reaction: After you reveal a plot card, choose a player. Look at the top 2 cards of that player's deck. Place 1 of those cards on the bottom of that deck, and the other on top. 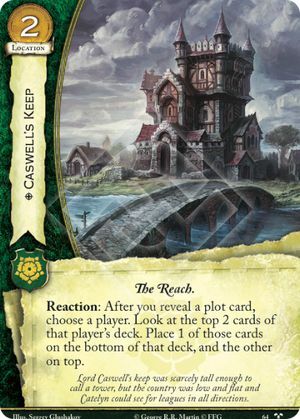 Lord Caswell's keep was scarcely tall enough to call a tower, but the country was low and flat and Catelyn could see for leagues in all directions. There Is My Claim #64. This ability is triggered after all When Revealed abilities of all plots have resolved.